A 60-year-old woman presented in September 2001 with a large (21 cm3 ) petroclival tumor involving both cavernous sinuses and the sellar floor without displacement of the brainstem. Physical examination was unremarkable for neurological dysfunction. About 8 years prior, she had undergone resection of a skull base meningioma. The large recurrent skull base neoplasm was treated with low-dose two-stage Gamma Knife (Elekta, Stockholm, Sweden) radiosurgery (GKRS). The treatment stages were 5 months apart, and the tumor volumes for the first and second parts of the treatment plan were 16 cm3 and 5 cm3, respectively. A margin dose of 11 Gy was applied to each portion of the target neoplasm. The patient did not develop acute ill effects and lived with the unchanged tumor for a long time following therapy. 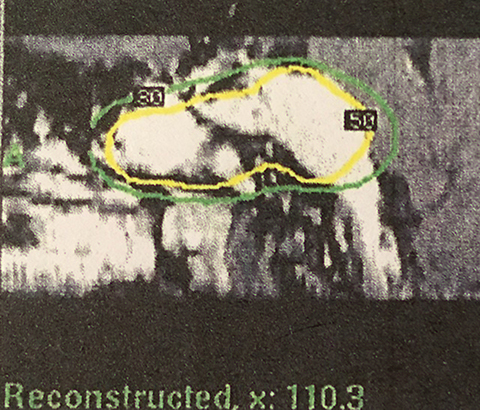 MRI shows the margin dose of 11 Gy prescribed at the 50% isodose line and demonstrates the petroclival tumor in contact with only a small portion of the brain including part of the radiation falling off into the bone, sphenoid sinus and infratemporal region (Figure 1). Meningiomas are considered particularly suitable for stereotactic radiosurgery because they are well-encapsulated, easily defined using contrast-enhanced MRI/computed tomography and responsive to radiation. GKRS is a preferred treatment for meningiomas that have a maximum diameter of 3 cm; a distinct margin and minimal to no surrounding edema on imaging; and a sufficient distance from critical normal tissue to allow for accepted normal tissue dose restriction. Benign neoplasms of the skull base pose unique challenges in radiosurgical treatment because of their irregular shapes, proximity to critical structures, and variable tumor volumes. Additionally, PCMs can be even more challenging because of their propensity to engulf nerves and blood vessels, invade the cavernous sinus, and extend to multiple cranial fossae and foramina. The goals in GKRS for large meningiomas, similar to those for smaller lesions, are preventing tumor progression and preserving neurological function. With intracranial benign tumor, which involves both the target volume and surrounding normal structures, late-responding tissues are of concern.1 Fractionated radiation therapy (FRT) relies on a tumor with hypoxic cells. It re-establishes oxygenated states, which results in such cells becoming sensitive to radiation. However, due to the slow-growing nature of meningiomas, these late-responding tissues may not gain additional benefit from FRT.2 From a clinical standpoint, large neoplasms are precluded from receiving an optimal prescription dose to the tumor margin because the fall-off in radiation dose into the surrounding brain tissues is not as steep. Management options for locally extensive meningiomas include cytoreductive microsurgery, as feasible, followed by stereotactic radiosurgery, hypofractionated radiosurgery or staged GKRS. Currently, there is a paucity of information about the long-term effects of staged, low-dose GKRS performed in these patients. The treatment plan (Table 111) was divided into volumetric stages with attempts to minimize dose overlap between tumor segments, especially outside the target. The plan design was to deliver a marginal dose of 11 Gy to cover the lesion (Figure 1) and 8 Gy to the adjacent optic nerve and chiasm. To safeguard visual function,12 the “suboptimal” treatment plan called for a deliberate reduction (to 8 Gy) in the margin dose to the part of the tumor that obscured the optic apparatus. Multiple isocenters were employed for both parts of the treatment scheme. A July 2011 MRI compared with a July 2009 MRI showed stable disease. At last follow-up (October 2012, 134 months after completion of GKRS), the patient was functional, requiring minimal assistance. However, she complained of diplopia and had occasional syncopal episodes. On clinical examination, upward gaze paralysis was noted but there was no apparent deterioration of vision. Although reported response rates after radiosurgery have ranged from 25% to 46%,3-5,12 local control of voluminous meningiomas is more difficult to achieve.13 Despite the large size of the PCM, we believe that the prolonged absence of tumor progression in our patient could be understood through a few concepts. First, the apparent cessation of tumor growth may be attributed to the extended follow-up and the reduced presence of hormonal activity on account of the patient’s postmenopausal status. Second, theoretically, superior dose-neoplasm congruity in the scheme should promote local tumor control and reduce the incidence of complications. Radiosurgical treatment of meningiomas frequently necessitates compromise between irradiating the tumor and risking damage to adjacent structures.14 Covering the entire tumor with the prescription dose remains the ideal radiosurgery strategy but, in practice, is not always safe or feasible. In our patient, given the tumor’s proximity to the optic nerve and chiasm, adjustments in the dose prescription and plan conformity were made, resulting in a plan that was highly conformal to the defined lesion, treated the bulk of the tumor with the prescribed dose, and accepted that part of the tumor was outside of the prescription isodose. Additionally, the radiosurgical treatment planning technology made it possible for the dose gradient to be steeper in the direction of the optic apparatus. After reviewing the literature about the use of staged, low-dose GKRS3-7 for mostly skull-based meningiomas with maximum tumor volumes ranging from 28.9 cm3 to 90.3 cm3, we found 2 other patients who experienced long-term progression-free survival up to 120 and 182 months.3 The noted sustained effect suggests that recurrent petroclival meningiomas should be treated as aggressively as possible. This was highlighted in a recent report by Li and associates17 regarding 39 patients. Those individuals rejecting treatment suffered a significantly poorer overall survival (7%) and shorter survival duration (42 months), while patients who were treated exhibited better corresponding outcomes of 67% survival, lasting 86.9 months. Given that benign meningiomas are characterized by slow growth, accounts of successful long-term outcome achieved with radiosurgery are important to document. This report described a case of extended progression-free survival observed after staged low-dose GKRS for a sizable recurrent petroclival meningioma. The critical location of the meningiomas underscores the importance of utilizing improved neuroimaging, radiosurgical 3-dimensional conformal treatment planning and technical expertise. Staged low-dose GKRS for large skull-based meningiomas appears to have balanced treatment success with adverse radiation-related effects. Simonova G, Novotny J Jr. Hypofractionation using gamma knife. In: Liscak R, ed. Gamma Knife Radiosurgery. New York, NY: Nova Science Publishers; 2013:113-122. Chung LK, Mathur I, Lagman C, et al. Stereotactic radiosurgery versus stereotactic radiotherapy in benign meningioma. J Clin Neurosci. 2017;36:1-5. Haselberger K, Maier T, Dominikus K, et al. Staged gamma knife radiosurgery for large critically located benign meningiomas: evaluation of a series comprising 20 patients. J Neurol Neurosurg Psychiatry. 2009;80:1172-1175.
wai Y, Yamanaka K, Nakajima H. Two-staged gamma knife radiosurgery for the treatment of large petroclival and cavernous sinus meningiomas. Surg Neurol. 2001;56:308-314. Pendl G, Unger F, Papaefthymiou G, Eustacchio S. Staged radiosurgical treatment for large benign cerebral lesions. J Neurosurg. 2000;93 (Suppl 3):107-112. Nakaya K, Hayashi M, Nakamura S, et al. Low-dose radiosurgery for meningiomas. Stereotact Funct Neurosurg. 1999;72(Suppl):67-72. Iwai Y, Yamanaka K, Ikeda H. Gamma knife radiosurgery for skull base meningioma: long-term results of low-dose treatment. J Neurosurg. 2008;109:804-810. Liscak R, Simonova G, Vymazal J, Janouskova L, Vladyka V. Gamma knife radiosurgery of meningiomas in the cavernous sinus region. Acta Neurochirurg. 1999;141:473-480. Hasegawa T, Kida Y, Yoshimoto M, et al. Long-term outcome of gamma knife surgery for cavernous sinus meningioma. J Neurosurg. 2007;107:745-751. Skeie BS, Enger PO, Skeie GO, Thorsen F, Pederson PH. Gamma knife surgery of meningiomas involving the cavernous sinus: long-term follow-up of 100 patients. Neurosurg. 2010;66:661-666. Nakaya K, Niranjan A, Kondziolka D, et al. Gamma knife radiosurgery for benign tumors with symptoms from brainstem compression. Internat J Radiat Oncol Biol Phys. 2010;77:988-995. Ganz JC, El-Shehaby A, Reda WA, Abdelkarim K. Protection of the anterior visual pathways during gamma knife treatment of meningiomas. Brit J Neurosurg. 2010;24:233-243. Santacroce A, Walier M, Regis J, et al. Long-term tumor control of benign intracranial meningiomas after radiosurgery in a series of 4565 patients. Neurosurg. 2012;70:32-39. Rowe JG, Walton L, Vaughan P, et al. Radiosurgical planning of meningiomas: compromises with conformity. Stereotact Funct Neurosurg. 2004;82:169-174. Stafford SL, Pollock BE, Foote RL, et al. Meningioma radiosurgery: tumor control, outcomes, and complications among 190 consecutive patients. Neurosurg. 2001;49:1029-1038. Nedzi LA, Kooy H, Alexander E III, Gelman RS, Loeffler JS. Variables associated with the development of complications from radiosurgery of intracranial tumors. Internat J Radiat Oncol Biol Phys. 1991;21:591-599. Li D, Hao SY, Wang L, et al. Recurrent petroclival meningiomas: clinical characteristics, management and outcomes. Neurosurg Rev. 2015;38:71-87. Ampil F, Vora M, Hardjasudarma M, Nanda A. Long-term outcome after two-stage low-dose Gamma Knife radiosurgery for large recurrent petroclival meningioma. Appl Rad Oncol. 2017;6(1):27-29. Dr. Ampil is a professor and Gamma Knife radiosurgery radiation oncologist; Dr. Vora is a fellow in the Department of Pathology; Dr. Hardjasudarma, is a professor in the Department of Radiology; Dr. Nanda, is a professor and chair of the Department of Neurosurgery, Louisiana State University Health Sciences Center, Shreveport, LA.